Optional: Chocolate chips, dried fruit, other nuts, banana chips, etc. 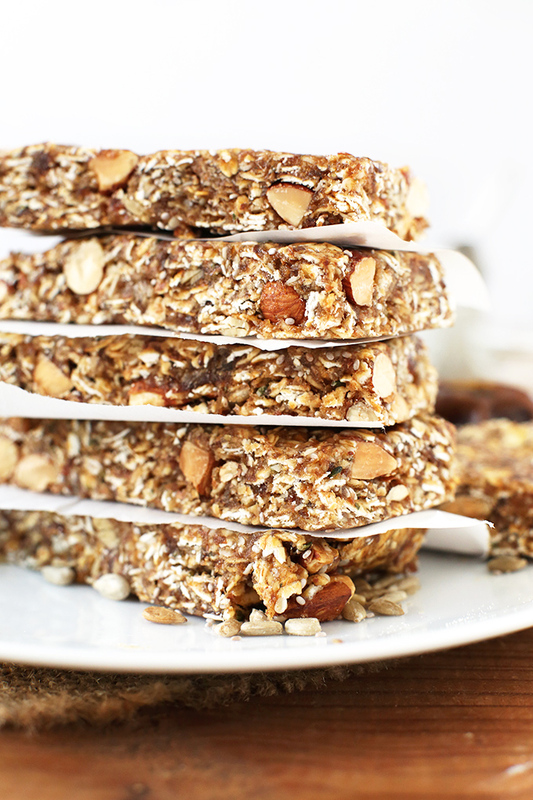 Toast your oats and almonds in a 350º oven for 13-15 minutes or until slightly golden brown. Place oats, almonds dates in mixing bowl. Add seeds and set aside. Warm agave and peanut/almond butter in saucepan over low heat. Stir and pour over oat mixture, then mix, breaking dates to disperse. Use a spoon/ hands to mix. Cover with parchment paper then press down, and pack it tightly. This will help them from being crumbly. Chill in the refrigerator or freezer for 15 to 20 minutes to harden. Remove bars from dish and chop into 10 bars. Store in an airtight container for up to a few days.